What are AC joint problems? The AC joint, or acromioclavicular joint, is the junction where the clavicle, or collarbone, attaches to the shoulder blade. This joint is a small bump that can be felt over the top of the shoulder. The AC joint is stabilized by ligaments that can be injured by a direct fall onto the front or top of the shoulder. This type of injury is called an AC joint sprain or separation. The AC joint can also undergo degeneration over time, especially in long-term weight lifters or people who do a lot of overhead work. This is known as degenerative joint disease of the AC joint, or AC joint arthritis. Arthritis or degeneration of the AC joint is usually felt as pain at the end of the collarbone or generalized soreness in the front and top of the shoulder. An AC joint sprain usually occurs after a fall or blow to the front/top of the shoulder and causes acute pain. 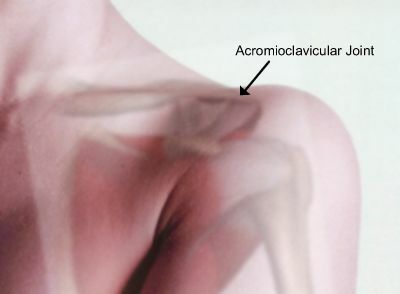 In a severe sprain, the ligaments of the AC joint can tear, and the end of the collarbone will become more prominent, resulting in a noticeable bump.